Make your party canopy more versatile with these Velcro sidewalls. You can add privacy for a more exclusive event, or you can protect your guests from sun, wind, and rain. The walls install easily with stainless steel snaps along the top, reinforced with 1" webbing, and they connect with Velcro on either side and along the bottom. Built of solid white 13 oz. 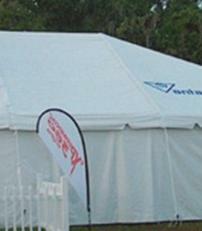 block out vinyl, these sturdy sidewalls are compatible with both pole and frame tents. This product measures 8' in height and is available in widths of 10', 20', and 40'. We have two Premier 10/10 canopies, but now we're looking to purchase a 10/20 Premier. Can you tell me if the 20 ft operates as the 10/10 does? Yes, the 10x10 and 10x20 Premier tents will operate the same way.